Meet Tony Perez aka "Big Tone". 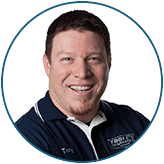 He has 24 years of experience in the Automotive industry. He enjoys playing golf, target shooting, and reading. His favorite food is a Toto's Pizza. He has 2 dream cars, a classic 1968 Camaro, and a modern Lamborghini or Aston Martin Vanquish. He is a fan of the 49ers, SF Giants, SJ Sharks, and the GS Warriors. He loves working at Toole's Garage it is an awesome family and the way we take care of customers is second to none. It is Auto Repair done right.